Thomas J. Reigstad, right, is emeritus professor of English at Buffalo State College. 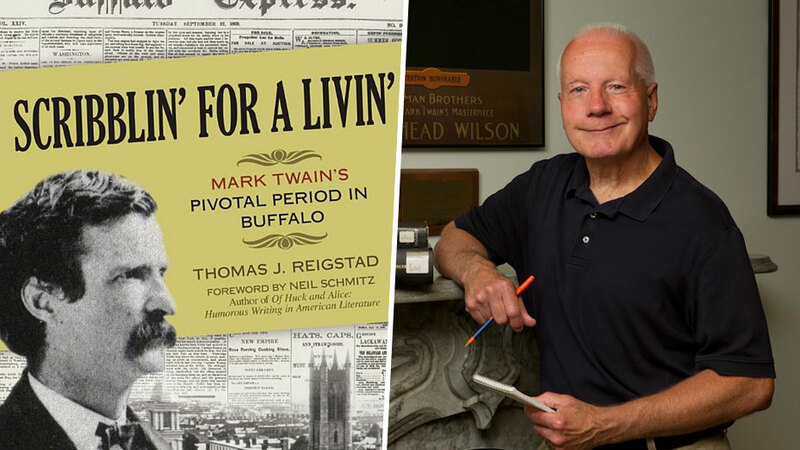 So Tom Reigstad summarizes in Scribblin’ for a Livin’: Mark Twain’s Pivotal Period in Buffalo, his detailed and informative accounting of this iconic author’s 20-month stay here between 1869 and 1871. Those months began well. His The Innocents Abroad had been published to critical acceptance and bestseller status. Twain’s prospective father-in-law, Jervis Langdon, helped him buy half interest in the Buffalo Evening Express. He contributed many pieces to the newspaper; however, much of his time those early months were spent on the lecture circuit. Between November 1, 1869 and the following January 21, he spoke to 50 audiences. He was still developing the style that would serve him so well later, and a few of those talks did not go well. After one the Jamestown Journal suggested that “if his lecture weighed 225 pounds, then 224 pounds, 13 ½ ounces were nonsense.” He had walked into a local tiff between those who wanted serious talks and those who wanted simply to be entertained. Despite these final depressing months and his quite reasonable comment given the circumstances, Twain did not desert Buffalo. He maintained many friends here and returned over a dozen times. Okay, that’s the history. Reigstad is not simply narrating a tragedy although that story alone is important in that it would certainly contribute some of the darker thoughts that color some of Twain’s later writing. Rather, like us, Reigstad is interested in the writing itself and he illustrates Twain’s early promise and growth with 70 pages of excerpts from his newspaper writing. I found this book informative, but in the end also highly entertaining. Thomas J. Reigstad is emeritus professor of English at Buffalo State College.